Gone are the days when a notebook was just a device! 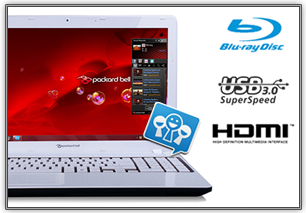 The Packard Bell EasyNote TV looks great, feels great and is a delight to use. Let this notebook be your mobile multimedia centre, your door to social networking, and your best fashion statement too! 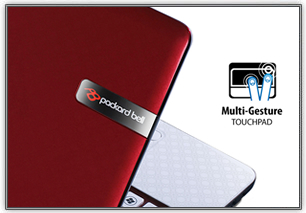 Whether open or closed, the Packard Bell EasyNote TV, donning a 15.6" HD display, looks and feels great. On the outside, sleek curves and an organic bamboo weave design evoke a sense of calm strength. Inside, the patterning is echoed on the palm rest area, which includes a multi-gesture touchpad that's 20% larger than standard, for simpler navigation The stylish chiclet keyboard is rimmed by the same colour as the cover -- Ebony Black, Moonstone White or Garnet Red -- creating a unique sense of design continuity. Robust performance and graphics, smart features, and a battery that lasts up to 5 hours make your life smooth wherever you may go with this easy to carry notebook. 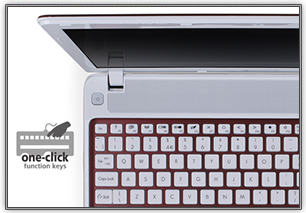 One-click hotkeys "iconized" on the keyboard grant instant access to the stuff that matters most: social networks, music, wireless connectivity, and more. Software-wise, Nero® 10 BackItUp Essentials gives you the peace of mind you seek with just one button press on the MyBackUp key. Use the multi-in-1 card reader to shuffle your pics to where you want them. The Packard Bell EasyNote TV ‘s Wi-Fi® network connectivity gets you online from any hotspot in a flash. The HD webcam gives you all the face time you desire, and sports an LED light that conveniently tells you when it's on or off. Socializing is a breeze: Just press the social networking key and you're connected to Facebook, Flickr, YouTube™ and Twitter all at once. Keep up with today's blockbuster movies by downloading them to your TV Series (use the USB 3.0 port* to move multimedia files faster than ever! ), then plug into the HDMI® port to watch them on a big-screen TV. Take the HD extravaganza one step further by popping a show into the Blu-ray Disc™* player! *Specifications vary depending on model.